Mind mapping is the process of creating a diagram used to represent words, ideas, tasks, or other items linked to and arranged radially around a central keyword or idea. I have created a mindmap of Linux to get a visual idea of the number of Linux distributions out there and their relationships with each other. There are umpteen GNU/Linux distributions and then some more. Many claim their roots in Debian and others in Red Hat. Still others swear that they are unique and were created from grounds up. Wouldn't it be nice if we had a picture which gave a broad idea of the roots of each GNU/Linux distributions? Well look no further. Here is a mind map of almost all GNU/Linux distributions (atleast the mainstream ones). Though there is a good chance that I could have missed some. The mind map below shows the relations between different GNU/Linux distributions. Fig: Mind map of GNU/Linux distributions and their relations. 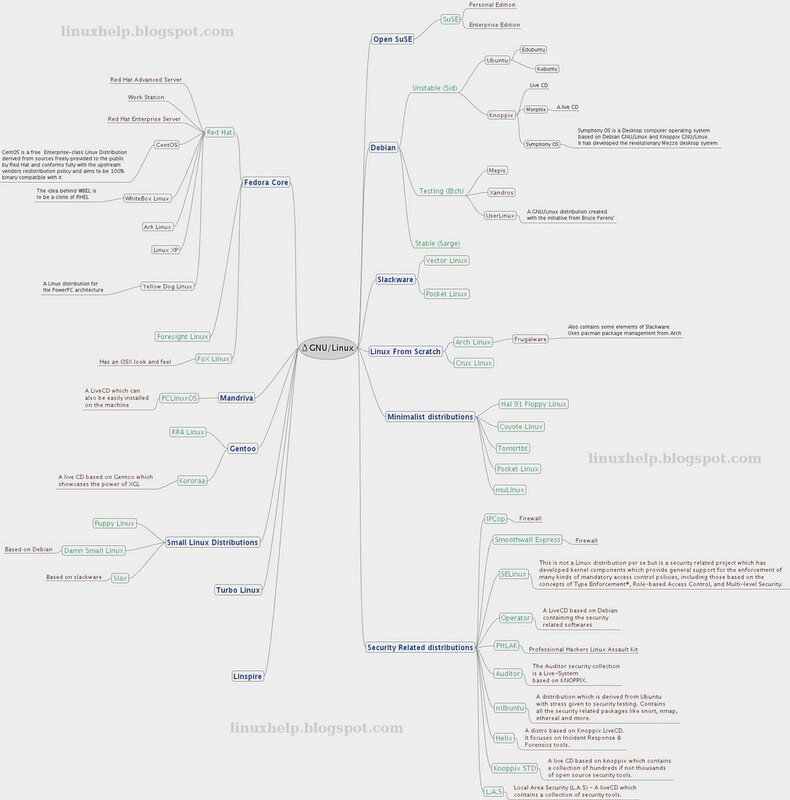 Update: Mind Map of Linux Distributions Version 2 released!! Thanks for the diagram! It is very helpful. But I'm sure everyone will have their own additions - the main thing is how useful it is to have one pre-done. Missing some connections. DSL is based on Debian, and should link from there. Similarly Slax from Slackware. And SuSE and Mandriva both share some origins with Red Hat (RPM-based), so there should be some link there. And I don't see GoboLinux--that's sufficiently different from the others to be worth mentioning, I think. Nice diagram - something like this is long time a coming. However I wonder if the diagram could be better organised. I would have draw it as a dendrogram (example). In fact if one built a matrix of shared properties, one could stick it into an app like clustalw and it would resolve the tree of relationships for you. The outputs could then be stuck into a program like TreeView to render the tree as a graphic. Great stuff you have done here anyway! Very nice diagram you did. DistroWatch has a database like information on how “independent” is a determined distro, but having this information visually like on this diagram you made is much nicer. But I have some comments regarding to it. —You should point out that Mandriva was once derived from Red Hat, but through it's evolution it changed so much that could be now considered an independent distro. —Linspire was based on Debian, although I'm not sure from which branch of it (I think it was the testing one). OK, as a current generation map it looks fairly good, though Linspire is a Debian derivative, as is Xandros (which I didn't see on your map, but I may have missed it). What it lacks is the historical perspective. Historically, SuSE is a Slackware derivative and Madriva is a Red Hat derivative. I could link multiple nodes together like slax getting linked from small linux distributions and also from slackware. But it might clutter the map. So I chose to list them seperately. Carlos, you are right. Mandriva was once derived from redhat. But as I said earlier I have to figure out how to cram all this info without cluttering the map. My main aim was to make sure the end result was not cluttered that no one could make sense of it. I heard that the link you provided on nUbuntu was an april fools joke :). AFAIK, nUbuntu is alive and kicking. I have included Xandros as a debian derivative. You are right on Linspire. But hasn't the project evolved so much that there is little semblance with the original Debian ? That is why I listed it seperately. So also with Mandriva and SuSE. Frugalware is based on slackware, its name was slackware+ in early stage. Then vmiklos added pacman to it. So frugalware actually slackware based and nothing to do with archlinux except pacman. just one comment: Coyote Linux has already a fork, the BrazilFW. Foresight is not a derivative of Fedora at all. It is a derivative of rPath, which is its own distro built from scratch. Kororaa uses a script to automate much of the Gentoo install and also some pre-defined desktop packages. It makes installation easier than Gentoo. The XGL liveCD is based off of Kororaa and created by one of the devs, but is not the Kororaa distribution. There is also Jackass! linux, based off of Gentoo, which uses a more updated toolchain. It's a small project so I don't know if you would want to add it (http://jackass.homelinux.org). You left out yggdrasil, which was the first linux distribution I ever used. One of the earliest ones, to be sure. "Thanks for all being good sports and playing along ;-) but for the sakes of tradition of April 1st..."
The current version of Mepis in testing is based off Ubuntu. "almost all GNU/Linux distributions (atleast the mainstream ones)"
Which is it, almost all or all the mainstream of almost all the mainstream? Incidentally, this map I linked to could also be used to map the rise, splitoffs and falls of the various distro's over the years. Better than this mindmap model I think. ps. Fedora Core did not spawn Red Hat, RHL's been around long before fedora was brought to live. And Mandriva as others have pointed out stems from Mandrake stems from Red Hat. "—nUbuntu is not a distro anymore. Canonical asked them to terminate it's distro, because it could affect their reputation. Read about it at: http://digg.com/linux_unix/Canonical_has_asked_for_nUbuntu_to_Cease_Develop"
Dude, that was an April Fools Day joke. Okay, firstly to anyone who I may have upset :-) I am sorry and to those who had a laugh, fell for it, and downloaded it before it was "removed". Thank you to those who dugg our story and helped it make the frontpage. For those who would like to see here is a screenshot of digg.com. How about a screenshot of our lovely pink site. Note: Beware of next year :-)"
Yoper is missing on your LFS tree. Yoper is using Linux from scratch as a base. Excellent work! I look forward to the next iteration of this (please be inspired to create one!). Might I recommend a different format that lends itself to better compression of homogeneous color areas? GIF, perhaps, is a better alternative. PNG would be ideal. Isn't Nubuntu an April Fool's Joke? then there are small distros, network or security related ones etc. Nice, very good for a overview. - Red Hat came first, later became two forks: Fedora Core and Red Hat Enterprise. Yellow Dog came from this first "Red Hat". - Mandrake came from Red Hat (that old one), merged with Conectiva (also from RH) and became Mandriva. Great idea, but as has been pointed out, there's a few things that are a little bit topsy turvy. - Red Hat came first, fedora clearly came from Red Hat. - Arch Linux is inspired by many, but based on no other distro. It ought to be in a category of it's own. There is no LFS in the foundations of Arch Linux. - Frugalware is slackware + pacman. But not everything connects right. Mandriva (formerly known as Mandrake) was based on Red Hat. Mepis is based on Ubuntu these days. ArchLinux' core is actually based on CRUX. Kororaa has a live CD, but actually it's just a normal Gentoo-based distribution. They made the live CD afterwards. Thanks for this mindmap. Distrowatch ( http://distrowatch.com/dwres.php?resource=independence ) has a lot of distro info as well. Don't forget RedFlag and some other asian distributions (Like asia linux and nigata linux). Linspire should be linked with Debian. From Slackware you should derive Slax, and from Slax, DNALinux and other Slax based live distros. Linspire may have evolved such that they're no longer reliant on Debian, or have users familiar with apt-get / dpkgs, but I'm pretty sure a) the relation once existed and b) it still uses much of the same technology under the hood, ie dpkg etc. Linspire is currently considering some techniques for selling software to Ubuntu users, like mp3 players and other non-free (in the most common sense) packages, so I think for all the glue and eyecandy placed on top of it, Linspire is still Debian derived. So I think a mind-mapping of distros should likely involve this link. Of course, many of the distros cant be represented as a simple tree; someone suggested that SuSe was slackware plus RPM added in later. Gosh! I'm so embarrassed! How could I be tricked on April's fools news (about the nUbuntu). Thanks for everyone who pointed this out for me. Also VLOS or Vidalinux is derived from Gentoo. One of its few off shoots. Auditor has been renamed to BackTrack (after merging with Whax). Any chance you could update it or release it publicly for someone else to maintain? Linspire recently switched to an Ubuntu base, and Mepis did a while ago. You also forgot Xubuntu. Besides that, I love the diagram. Cheers.